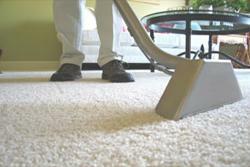 Your carpet will be cleaned in strict accordance to what the carpet manufactures recommend. Please refer to the list below for the description of the steps we take to clean your carpets. Your carpet cleaning will be performed with a state-of-the-art system to rinse your carpet with 240° + water. This new system is unlike anything you have ever seen in carpet cleaning and is BRAND NEW to the entire industry. Step 1 - We pre-vacuum with our high powered commercial vacuum to remove dry, gritty soils. Step 2 - We pre-condition with all natural cleaning agents to loosen sticky, stuck-in dirt and oily types of soils. Step 3 - We vacuum along the edges of baseboards to remove dry soils, hairs, and dust. Step 4 - Your carpet is then rinsed with 240°+ water from our truck mounted machine. This dirty water is extracted with a powerful vacuum into a holding tank in our truck. Step 5 - Thorough agitation and extraction that gently removes 98% of all the water used to leave your carpet dry in 2-3 hours. Step 6 - FREE spot cleaning of remaining spots that did not respond to our cleaning procedures. Most cleaners charge much more for even simple spot removal efforts. By utilizing our state-of -the-art Vortex 7000 cleaning system, we get your carpet “hot water” steam cleaned and dry within four to six hours, not the two to three days that you will have with most of the “budget” cleaners. The following are just a few other benefits of our powerful truck mounted cleaning machine with water temperatures and suction not obtainable with portable equipment. Do you want your carpets really, really clean and want them dry in half the time? Then Insist on the BIG carpet cleaning truck you have seen in your Peoria, AZ neighborhoods! Until you have seen the patented Vortex Carpet Cleaning Machine in action, you haven't seen how spotless and fresh your carpets can be. Nothing else gets your carpets and upholstery as clean, or dries them as quickly.